Hortus Camdenensis | Rosa sulphurea Ait. & Lindl. The ‘Double Yellow’ rose produces a moderately thorny shrub, eight or nine feet high with large, very full, globular and regular flowers of pure yellow. The flowers require excellent growing conditions to open fully. [Gore, Paul (1848, 1863, 1888, 1903), Rivers (1854, 1857, 1863), Willmot]. Grown in European gardens since at least the 1600s, it is believed to be of Persian origin. It was probably first described by Parkinson in the English literature. 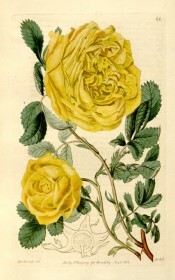 It was figured in the Botanical Register as Rosa sulphurea. [BR f.46/1815]. There is also a dwarf form known as ‘Pompone Jaune’, ‘Dwarf double Yellow’ or Rosa sulphurea minor. More details about Rosa sulphurea Ait. & Lindl. Rosa flava pleni flore Hort.